Munich in Autumn isn’t maybe the most predictable travel target but for many decision-makers, experts, project managers, IT architects, consultants and users it’s the place to go when Fujitsu’s largest IT-event in Europe took place on 6th and 7th November. 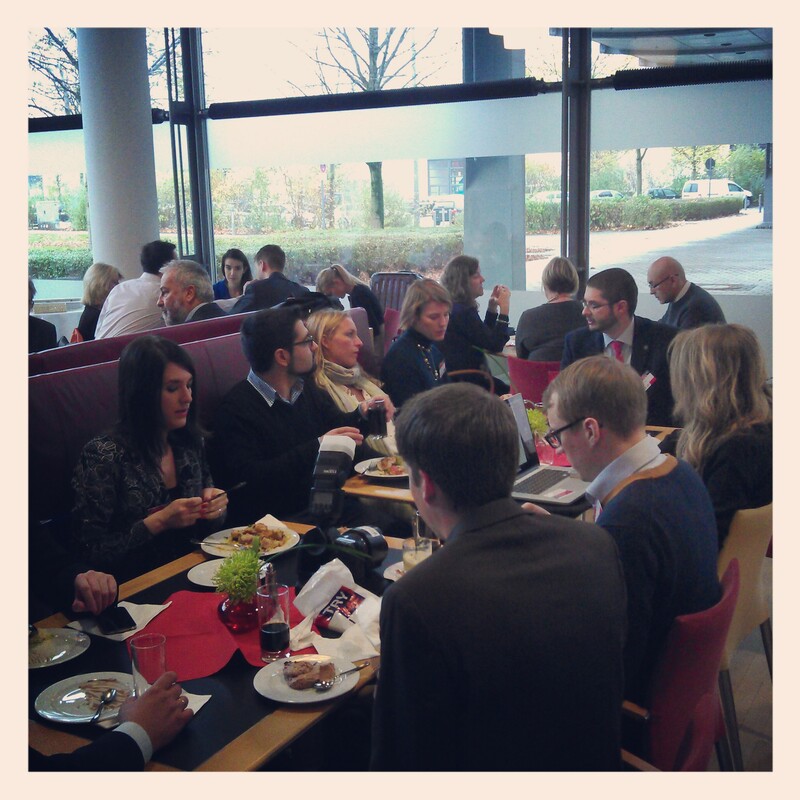 I was one of the invited bloggers to visit Fujitsu Forum 2013 and again it was very insightful and exciting two days. With the motto “Reshaping ICT, Reshaping Business and Society” there were over 11,000 attendees around the world getting new information and looking for strategic and operative options for modernising and developing their IT. 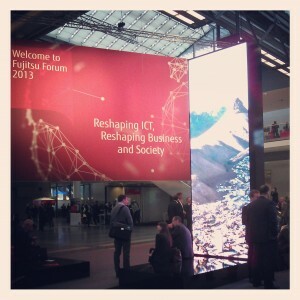 Fujitsu Forum 2013 in Munich is Fujitsu’s largest IT-event in Europe and was this year attended by more than 11,000 IT experts from around the world. With keynotes, breakout sessions, expert talks, exhibition and evening event the Fujitsu Forum is good place to get new information and looki for strategic and operative options for modernising and developing IT. 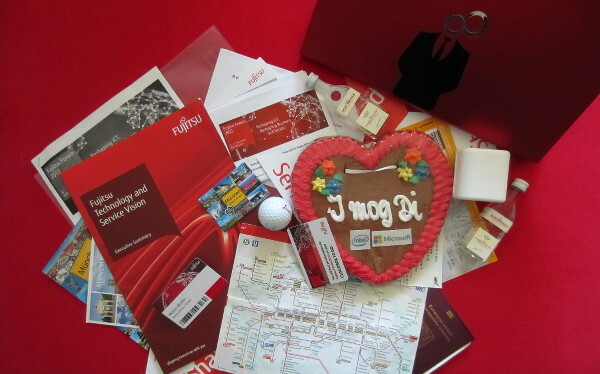 Just like last year, I was invited by Fujitsu LIFEBOOK4Life campaign with three other insiders aka bloggers to spend couple of days at the Forum and to get insight what the future of IT might look like. This year the Forum was held with the motto “Reshaping ICT, Reshaping Business and Society” and the focus was more about how the technology affects us and how we can make it work for us. Or in business words: “How to combine business processes and IT to form a stable basis that will ensure growth and success in the future.” The main topic was reworked from last years’ “Reshaping ICT – Reshaping Business” and the ICT trend could be easily seen from the buzzwords I heard also this year. Consumerization, BYOD, tablets, virtualization, in-sync, cloud and “One workplace – on any device” were still hot topics but maybe not so strong than last year as most of the hype has passed. Our great LIFEBOOK4LIFE team had planned two keynotes and one breakout session which meant the days wouldn’t be so packed and we would have time to share our insights and to stroll at the Exhibition area. We started with Defining Your Workplace Strategy: Our Recommendation to IT breakout session by Meinolf Althaus (Fujitsu) who told us how to manage the different users’ needs for the workplace. The three points were: Analyze your users and create user profiles (one size does not fit all); Accommodate multiple devices, operating systems, delivery technologies; Rely on a partner which offers an end-to-end portfolio. Last year we missed the opening keynote but this year we were wiser. 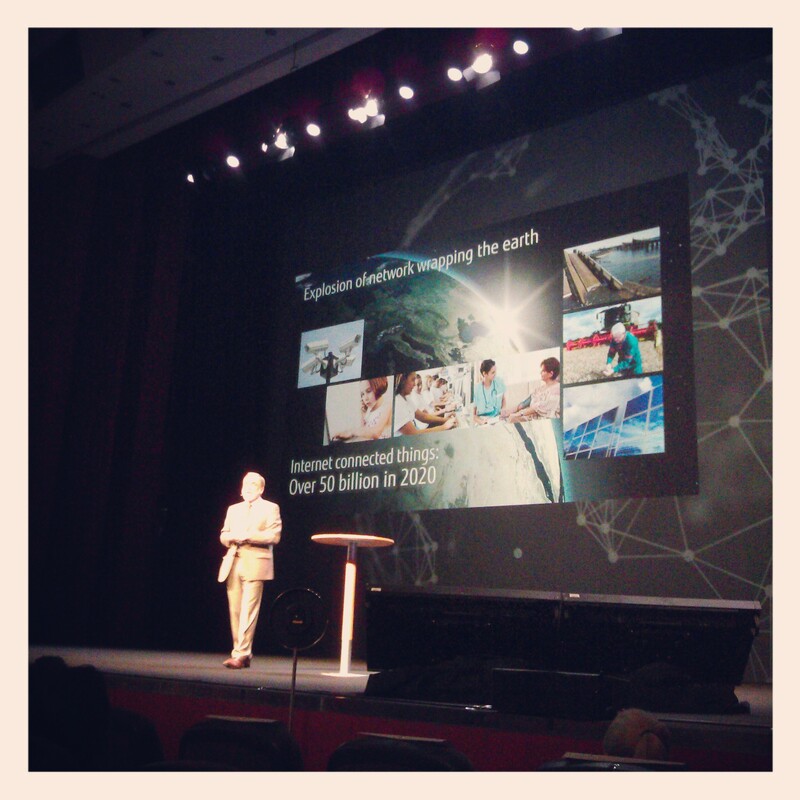 The opening keynote provided a view to Fujitsu’s technology and services vision: human centric intelligent society. 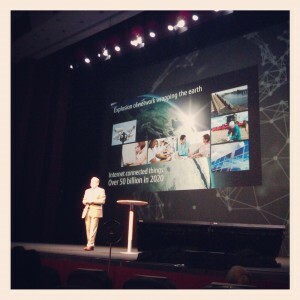 The keynote presented the idea behind the “human centric intelligent society” vision and also the exhibition was also built on the three dimensions presented on the keynote: Technology and infrastructure and integration (optimize ict systems from end to end); process and information (power business and society with information); people and innovation (create innovation through people). The main point was that we are in a global village and virtually everything and everybody are connected in one extensive network. But with global village come some challenges both in business and society sense. For example social media is more pervasive and the volume of information is astounding. The question is, how do you mine, analyze and act upon that data? For more detailed information check Marco Rossi’s short recap of the session and how Fujitsu’s services address this topic. Our last session was on Thursday and I have always liked Dr. Reger’s presentations which are both informative, clever and witty. The CIO Session: “All things considered” – How the internet of things changes our world gave us good ideas what are the technology trends that are going to affect our lives and businesses in the next few years and how the world could look like when every possible machine has it’s own IP address. In short “All things considered human centric intelligent society is the internet done right. The job is done by the things for the people. Internet of things will make our lives more complex but with multiple opportunities.”. The road to Internet of things isn’t yet paved and there are still many problems to solve like starting with IPv6 becoming mainstream, standards to control the devices and security issues. Reger gave some Sci-Fi like examples what kind of possibilities the Internet of things will present to help our everyday life for example by sensing different things and acting based on that information. It’s worth to check out the video recording of the session from the Documentation or read the written recap by Fujitsu’s Marco Rossi. 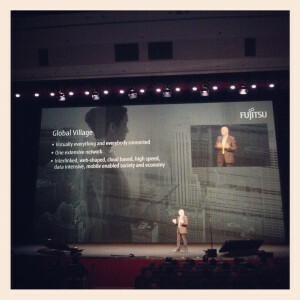 Overall, I have to admit I didn’t get a good grasp about the message of the Fujitsu Forum 2013 which had a bit different aspect to cover than last year. 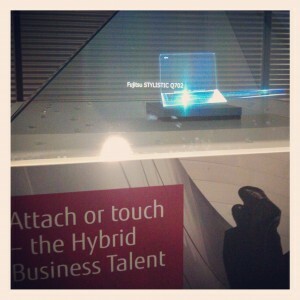 The same ideas were on the background but from my Fujitsu Forum 2012 insights the message is easier to pinpoint: “The work and workplace is changing to support mobility and working anywhere anytime. The borders between business and private life are blurring, consumerization (same devices home and work) and BYOD (bring your own device) are coming more common. We should think more about user-oriented workplace. In the future the devices we use will be more diverse and we have more of them. Thus there will be need for virtualization, syncing data and support for “One workplace – on any device” ideology. Different tasks have different needs for the device so we need a dynamic desktop experience.” Maybe the topic felt this year more vague as I attended two keynotes which had more abstract than concrete ideas how the workplace might look like compared to last years’ three breakout sessions. If you weren’t able to attend the Forum or some particular session you can re-experience the Fujitsu Forum 2013 and watch or download the presentations from Fujitsu Forum 2013 documentation page. 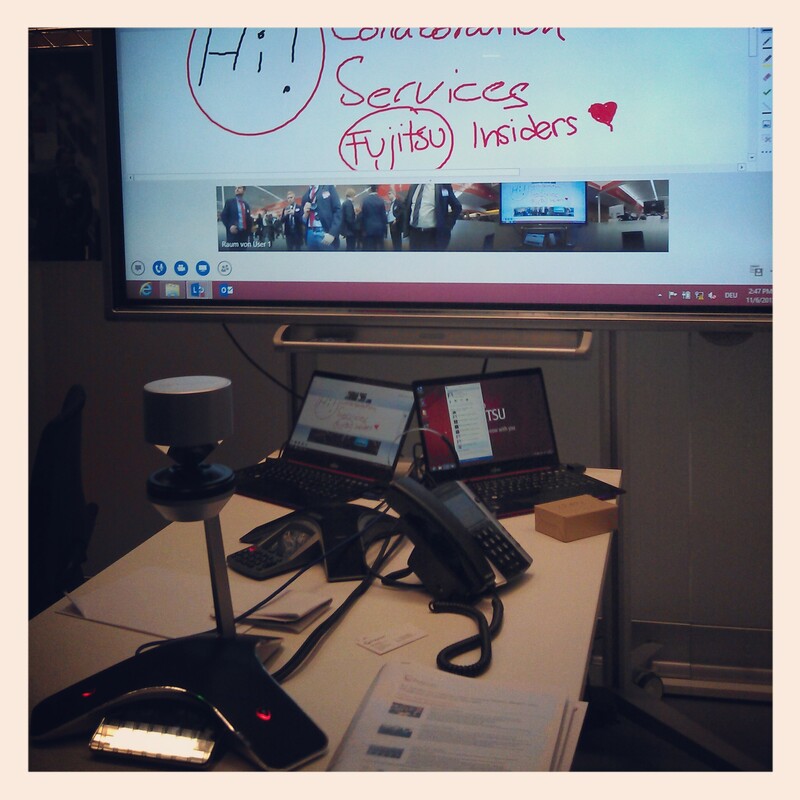 Between the breakout sessions and keynotes we had time to check out the exhibition are with 250 highlights from the portfolio offered by Fujitsu and its partners. 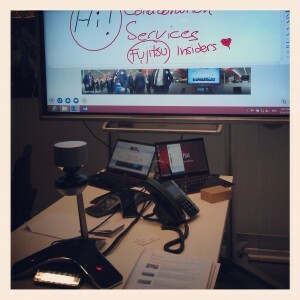 I especially liked innovative ideas like The Office 21: Intelligent Desk which showed how to make the physical desk better and the unified communication & collaboration setup (article by FujitsuFans.com) which presented how video conferencing and sharing ideas can work more seamlessly. I also didn’t know that Fujitsu also makes ATMs. Some highlight from the exhibition in 15 seconds: ATM, retail solution, unified communications, U904, T904, mainboards, displays, Eternus parts, intelligent desk, cad. And of course as a technology geek getting my hands on to Fujitsu’s new LIFEBOOKs Ultrabooks with IGZO display was nice. 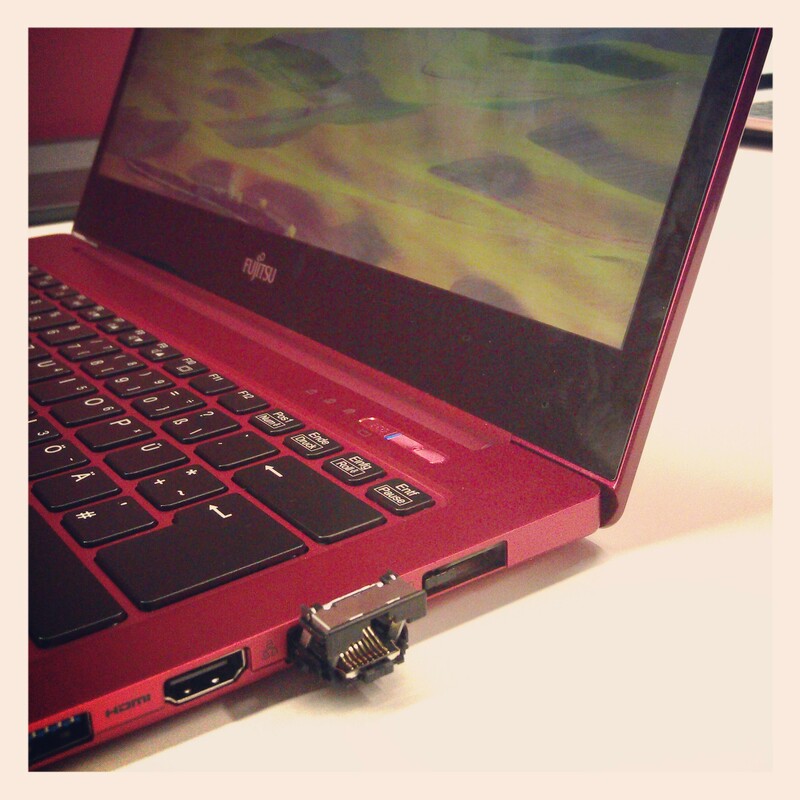 Both the versatile T904 convertible ultrabook/tablet and the ultra-slim U904 were beautiful devices and I especially liked how the RJ-45 port was designed. Also the semi-rugged STYLISTIC Q704 tablet had nice use cases and accessories to support it. 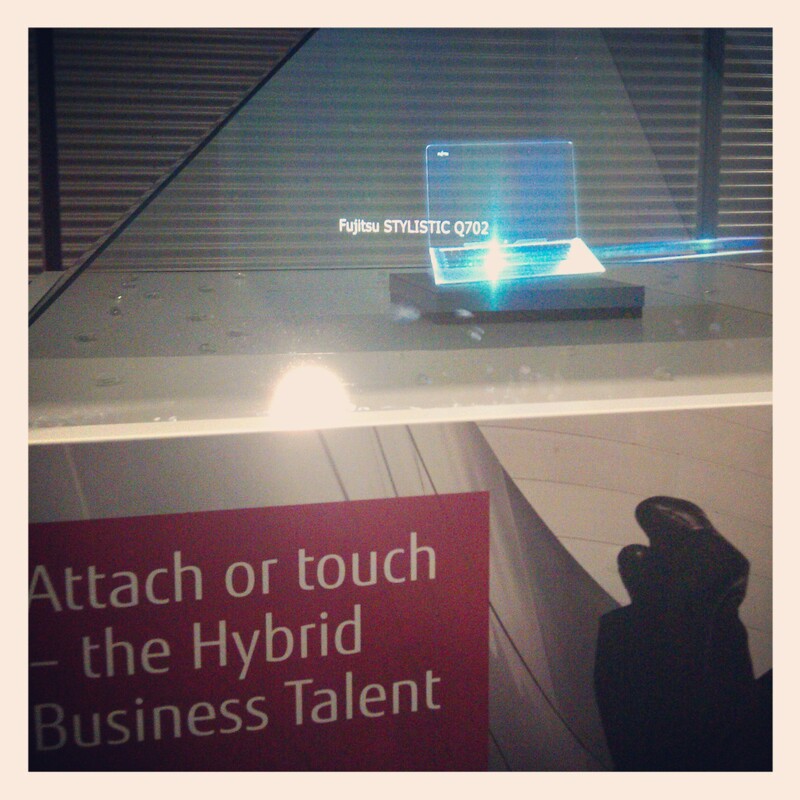 For more detailed information about the different topics presented at the Exhibition check the Fujitsu Fans -blog with the forum tag and the YouTube playlist. I just don’t understand how Abassin who keeps the Fujitsu Fans blog (MixBlogeu in YouTube) had time to do so many hands-ons and interviews at the Forum :) If you’re interested to know more about the new LIFEBOOK Ultrabooks U904 and T904 check the hands-on articles from the Fujitsu Fan blog as they present nicely what kind of Ultrabooks they are. For visual view and to get the overall feeling of the Fujitsu Forum 2013, Fujitsu DE has made day 1 impressions and day 2 impressions in pictures on Flickr. And lest the whole two days be just about technical topics there was an Oktoberfest themed evening event on Wednesday. This year the event provided something different and was more social than previous years’ concerts with Anastacia (2011) and Amy McDonald (2012) which were also nice. 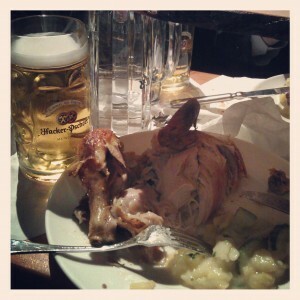 At the “Oktoberfest” there were special Bavarian dishes, such as crispy roast chicken (Hendl), spiced strips of pork belly (Hüttenspeck) and of course pretzels (Obatzda und Brezn) and excellent beer. And it was not just food and drinks as there were playful games like sawing a log, throwing a pint, hammering nails and throwing balls. If the games weren’t for you, you could take a ride in a carousel, ferris wheel or swing (schauke). 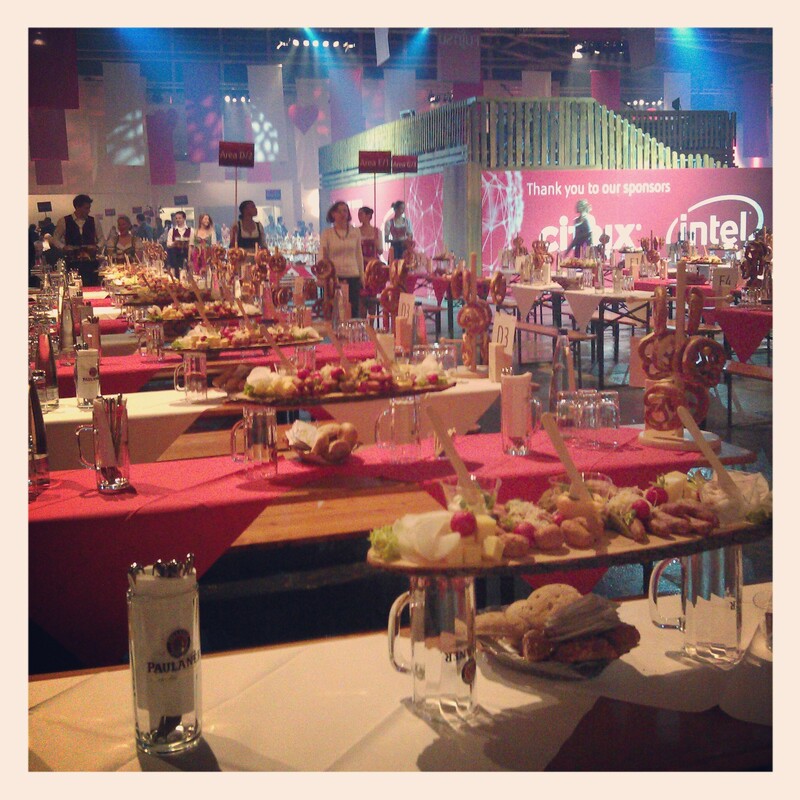 Oktoberfest by Fujitsu Forum 2013. G’suffa. Accidentally half a chicken. And weissbeer. Fujitsu Forum 2013 is over but the new insights are just starting to form up to new ideas how to do things better. This was my third visit to the Forum and every year has been interesting and a bit different and great on their own kind of way. This year the sessions, keynotes, I listened were more about ideas than doing and they gave a good view how the future might look like with trends like Internet of things and how Fujitsu sees the future and business through their “human centric intelligent society” vision. I also got to see great looking Ultrabooks, interesting new concepts and products and I really liked the Oktoberfest themed evening event which was more social than previous years’ concerts. The three days in Munich went fast and it was again great to visit Fujitsu Forum and to see other Insiders and the campaign crew. 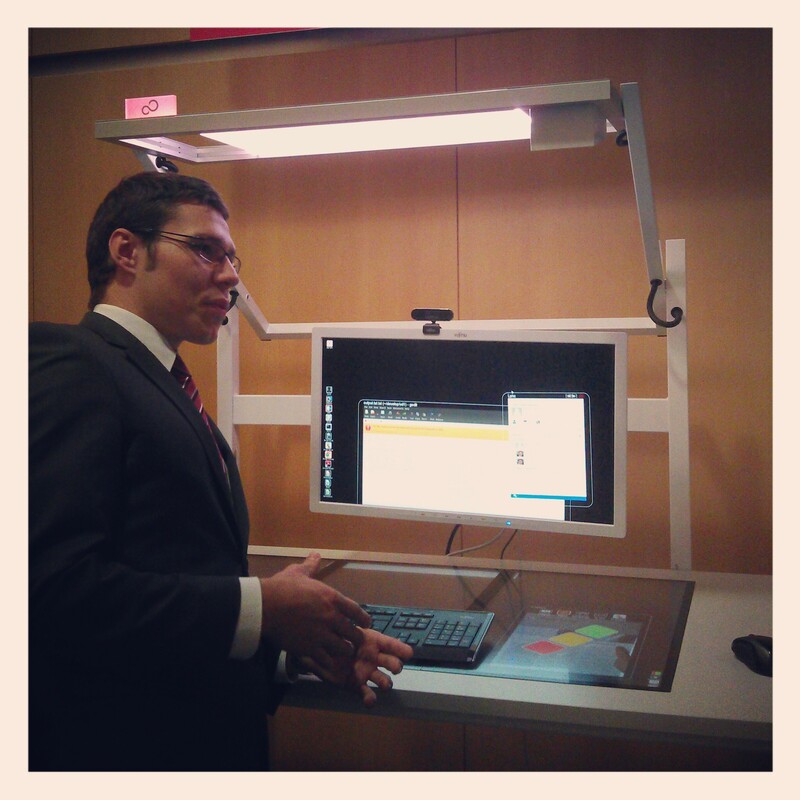 Thanks LIFEBOOK4Life and Fujitsu.